DJ Matman - DJ DAREDEVIL THE CLASSIX VOL.2. DJ DAREDEVIL THE CLASSIX VOL.2. 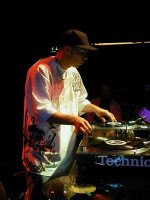 Easy blogworld, I’m back from a brief hiatus.. to kick off my return here is part 2 of my brother dj daredevil ‘s classix series, if you heard the first one (check out my last podcast if you didn’t!) then you’ll know what to expect!! Next-level turntable skills & classic cuts all the way. Hey Wassup Peeps ??? This is the second edition of my Classix Mix Collection …. “DJDAREDEVIL THE CLASSIX VOL.2″. For Those of you who gave me feedback on Vol.1 thanks for your support ..Let me know what you think of Vol.2 and watchout for Vol.3 Currently in the making !!!!…. Next: This Thursday.. Droppin’ Science Returns!! No other information about this user.